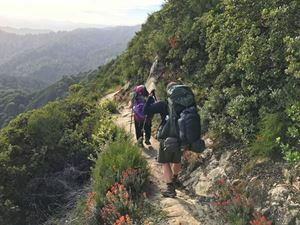 The Skyline-to-Sea trail through Castle Rock and Big Basin Redwoods State Parks descends from the crest of the Santa Cruz Mountains down to Waddell Beach. 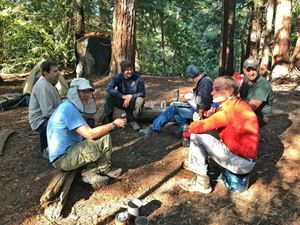 The hike is about 30 miles, depending on the exact route, and is usually done in three days, with overnight stays in established trail camps, all with potable water and pit toilets. Generally, the trail is shaded by mixed coniferous/deciduous forests, often in stream canyons. Occasionally, the trail travels on hillsides and ridges that are more-exposed and which provide exceptional views to the Pacific Ocean. Our timing was perfect with deciduous trees newly leafed out and many different wild flowers in exuberant bloom, including lupine, indian paint brush, monkey flower, and iris. The forests were awe-inspiring. Stately, sentinel Douglas firs and redwoods admit filtered light to an understory of broad-leaf trees, shrubs, ferns and their own seedlings: a palette of many shades and leaf shapes and textures of green, with dramatic sun-lit highlights, arranged around the trunks of large trees, both slender and stout, both rough and smooth, ranging from red to brown to grey, layer upon layer of vegetation. Water trickles and splashes, gurgles and churns, in springs and streams and rivers, sometimes in rapids and waterfalls, a distant murmur to an impressive roar. Bird calls ring out, branches snap, the winds rustles leaves and sometimes whines in a gale in the tree tops. The Skyline to Sea Trail provides a deep, soothing immersion in the riot of nature. Our group of eleven, ranging in age from 30s to 60s, discovered this spectacular trail together. We were ten men and one woman from LA, Oxnard, Ventura, Santa Barbara, Lompoc, Huntington Beach, and San Luis Obispo; some quiet, some talkative; some single, living alone or as roommates, some partnered with non-camping husbands at home; teachers and architects, managers of stores and property, doctors and therapists, promoters of fitness and nature, ex-marines and electrical engineers working for the Navy, human resource specialists and arts administrators; lovers of opera and jazz and country, knitters and weight lifters, readers and writers, horse-riders and cooks. 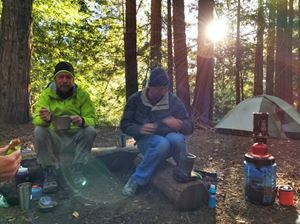 A varied group who came together with a shared interest in nature, backpacking and camping, and of being in the woods. Generous and curious spirits all, we formed a community who helped each other and learned together, who celebrated the same joys of the out-of-doors and who laughed and labored on the trail and in camp. 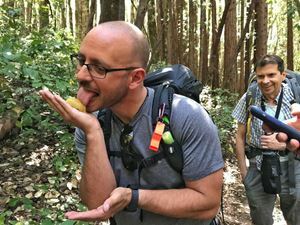 Chris Fava is an exceptional trip leader. He is organized, prepared and calm. He handed out state park maps with the trails for each day of our trip highlighted in a different color. He was clear about our route and mileages for each day and established places to re-group, so we could hike at our own pace. He carefully coordinated all of the logistics for the trip and was prepared for emergencies. He is also “good people”—gentle, kind, generous and a pleasure to spend time with. Four of us arrived early on Thursday to leave three cars for the end-of-trip shuttle at the Rancho del Oso Nature Preserve just above Waddell Beach at the end of the trail (we took Hwy 35 to Hwy 84 to Hwy 1 and back). A fourth car brought all the drivers back to Castle Rock State Park for the beginning of the trip. 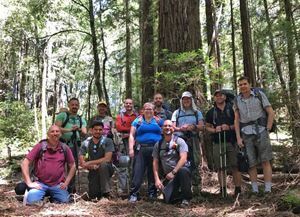 From the park entrance, we hiked 2.5 miles in to the Castle Rock Trail Camp along the Saratoga Gap Trail, and Chris met the rest of the group Friday morning at the park entrance. 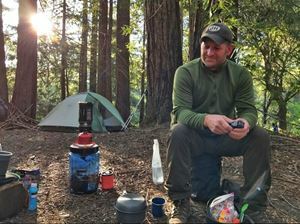 We had the large and spread-out trail camp to ourselves. Friday, the first full-day of our hike, was nine miles from the park entrance (6.5 miles from Castle Rock Trail Camp). 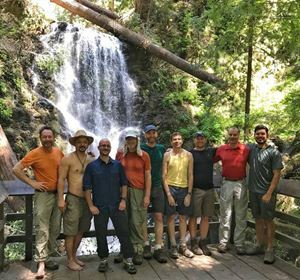 We hiked the Travertine Springs Trail, with a beautiful lunch stop at the San Lorenzo River. 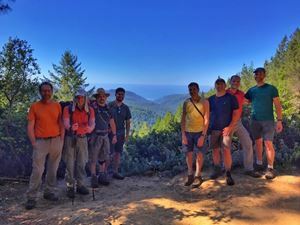 We continued past travertine springs to join the Saratoga Gap Trail, which we took to the Beekhuis Road, which led to the official Skyline-to-Sea Trail. All of these trail junctions are a little tricky, and you have to read the fine print at the top of each trail marker to have any chance of getting it right. Waterman Gap Trail Camp only has six sites, which we shared with two other small groups. We settled into sites 5 and 6, a bit hard to find beyond site 4, but the nicest of the lot. 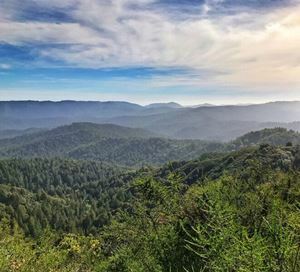 On Saturday, we hiked nine miles along the Skyline-to-Sea Trail, which basically follows route 236 through Big Basin Redwoods State Park. It eventually drops into the Opal Creek drainage, which we followed to the park headquarters, where we checked in for Jay Trail Camp. Arriving before 5 allowed drinks and snacks from the store (not cheap, however). Jay Camp again only has six sites, where level ground is at a premium. The two bike camp sites, 7 and 8, are much better. There are coin showers (a quarter a minute) at J camp and real flush toilets. 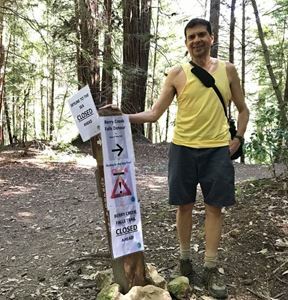 On Sunday, we got an early start, because the heavy winter rains had washed out a portion of the Skyline-to-Sea Trail, requiring a two-mile-longer diversion on the Howard King Trail, which follows a ridge rather than a stream valley. Two of our group decided to skip the last twelve-mile day and remained at park headquarters. They kindly watched all of our packs, allowing the rest of us the luxury of hiking the twelve miles with just day packs. There were great views from the Howard King Trail, which while more-exposed, was not overly sunny. 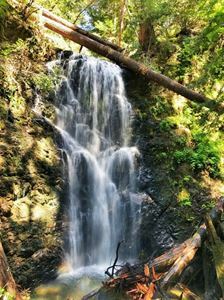 We drooped from the ridge into lush forest and eventually re-joined the Skyline to Sea Trail just below Berry Creek Falls. We did the half-mile hike up to the Falls for lunch, where a wood platform and wrap-around bench provided a stunning view of the Falls. The remainder of the hike was along Waddell Creek, with its lush riparian ecosystem. 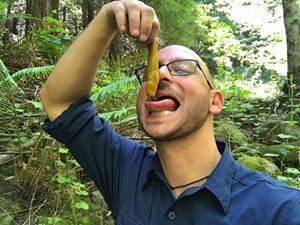 After a sunny stretch on a dirt road, we arrived at the Rancho del Oso Nature Center, which was happily open with a docent and a refrigerator stocked with cans of cold Arizona Iced Green Tea (only $1!). A short walk brought us to Waddell Beach and the Pacific. 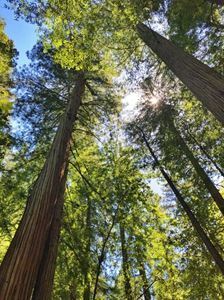 In order to collect our friends and packs at the Big Basin Redwoods State Park headquarters, we took 1 south to Route 9 along the San Lorenzo River to Route 236 through the park. This brought us back to the 9 which we took to 35 to get back to the cars at the entrance to Castle Rock State Park. The return shuttle was longer, 2 hours rather than 1. In the Castle Rock State Park lot at 5:30, despite the long drives home, we were reluctant to get into our cars and leave our new-found friends. Hugs all around and bittersweet good-byes. 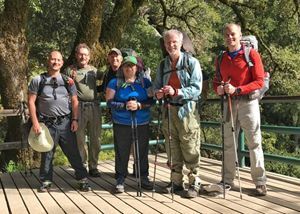 This was a five star hiking experience—a beautiful trail, a great group of people and an excellent trip leader. My only quibble was the intrusion of car sounds from nearby roads and gun shots form a nearby gun club and the crowds and noise at Jay camp. Usually, for this kind of effort and hiking distance, I expect to be a bit more remote. 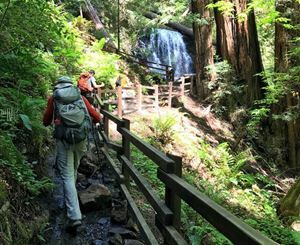 While not strictly a wilderness experience, nevertheless, for much of the three-day hike from the crest of the Santa Cruz Mountains to the Pacific, you could be joyously lost in nature.